Dan Gilbert's Bedrock company has launched a week-long test pilot program in downtown Detroit using driverless vehicles. 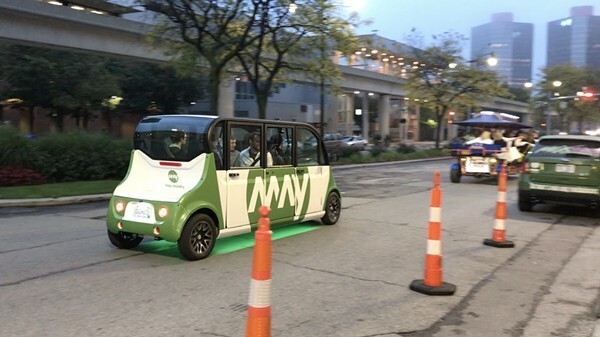 May Mobility, an Ann Arbor startup, is operating two six-seat vehicles that carry Bedrock employees between Cadillac Square and the Bricktown Parking Garage, Jennifer Ann Wilson of WXYZ reports. An engineer will be in the driver's seat as a precaution. The shuttles will go up to 25 mph from 7-10 p.m. through Friday. "We're learning all about the environments where customers want to operate these vehicles," May Mobility CEO Edwin Olson said. "That will tell us what tricks the vehicle needs to learn next."